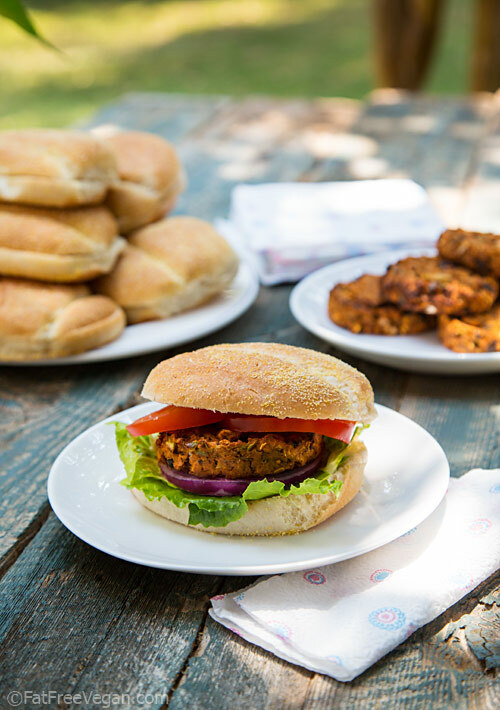 Sweet potatoes, black beans, and a hint of peanut butter combine with cumin and ginger to create these delicious West African-inspired veggie burgers. Happy Labor Day! Okay, I’m a few days late, but believe me, making these burgers was a labor (get it?) of love. I had a craving for a burger that would combine sweet potatoes, black beans, and West African seasonings, and I wouldn’t rest until I got it right. So I used my Labor Day weekend to make them three times until I finally hit on the combination of ingredients that got me sweet potato burgers that were rich with the aromatic flavors of cumin and ginger and moist but not mushy. Making 3 dozen burgers could be a pain, but I have a little secret to making them uniformly round without getting my hands too dirty: I use a 1/3-cup measuring cup to scoop up the burger mix and then use the bottom of the cup to press it into a stainless steel form. I know, I could buy a burger press, but the steel ring is less expensive, easier to clean, and doubles as a cuff bracelet when I’m feeling all Wonder Woman-y. Fortunately, my whole family, including “She Who Prefers Burgers Named Boca,” loved these burgers. 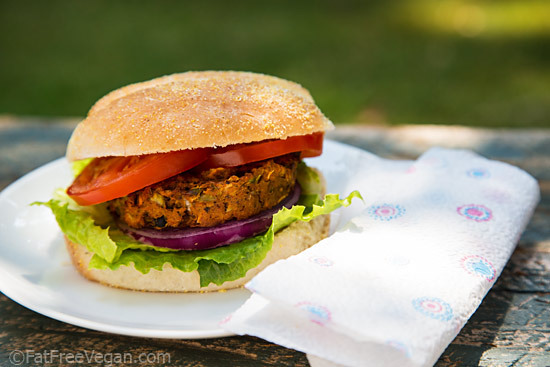 They’re a little softer than other veggie burgers, so they wouldn’t work well on the grill (though you could reheat them there), but the flavor is just incredible. I served them on buns with most of the traditional burger condiments–ketchup and my homemade mayo–but I left off the mustard because I wanted to be able to taste the burger’s seasonings. They’re also delicious without the bun, with a little chipotle mayo or sriracha ketchup. And they freeze well–in case you’re planning to make as many as I did! Grains of paradise are the seeds of a plant that grows in the swamps along the West African coast. They impart a complex peppery flavor with hints of cardamom and citrus. If you don’t happen to have them, use freshly ground black pepper and a little cardamom, as noted in the ingredients list. Form the mixture into 10-12 burgers, using 1/3-1/2 cup per burger. Burgers should be no more than 3/4-inch thick. Bake for 25-35 minutes, until outside is firm and brown but center is still a little soft. Remove from oven and allow to cool for a couple of minutes before removing from baking sheet and serving. Without peanut butter, contains 131 calories and .7g fat. 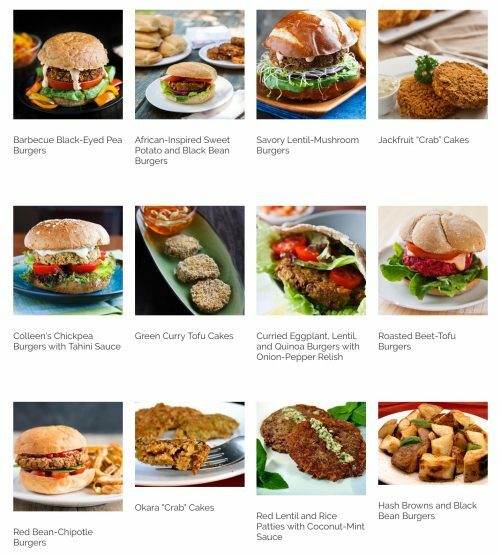 Looking for More Vegan Burgers? 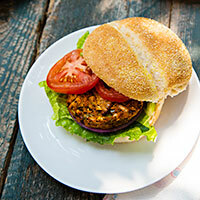 Check out all 12 of my burger recipes! This post contains Amazon affiliate links to products I actually use. When you buy something through them, I receive a commission that helps support this site. Thanks for your purchase! Wow, these sound great!! I LOVE The sesasonings. I will definitely try a gluten free version of these. I’ll probably use either potato starch or ground up buckwheat groats for the gluten. I just recently made your lentil mushroom burgers, and in the middle of things discovered I had no tomato paste. So I created a “paste” with cooked sweet potato and chipotle in adobo. It worked really well and tasted great, so I guess that set me up to embrace a burger with more sweet potato in it. And I’ll have to check out the stainless steel form. A girl can’t have enough Wonder Woman bracelets, right? And you definitely deserve yours for coming up with such a wonderful, tasty burger!! Would love to make these but haven’t come across vital wheat gluten here in England. Can you advise what it is? Really like your recipes and have just made the cumin vegetables over quinoa which was very tasty, thank you! I used a mix of tapioca flour and rice flour. It worked great! I also didn’t have cumin, and used regular paprika because I fidn’t Have Spanish paprika. This recipe is very flexible and forgiving!! Susan, what’s the best way to freeze them? I like to freeze them with pieces of parchment paper in between so that they don’t stick together. You can stack them this way in a plastic freezer box. I like to freeze veggie burgers on a cookie sheet, then transfer to a ziplock bag. Takes up less freezer space than a container. Hoping to make these later in the week! Do you freeze before or after they are cooked? I like to freeze after they’re cooked so they warm up quickly later. These sound delicious and I can’t wait to try them. I love your lentil mushroom burgers so I know these are going to be wonderful. I learned a great trick for making perfectly sized veggie burgers – using a jar lid like from a peanut butter jar or one similar in size, line it with plastic wrap and then press your burger mixture into it, patting it smooth, turn it over and the patty slides right out. Perfect burgers every time! That’s a great tip, Tami! That is such a helpful tip to use a jar lid to form perfect patties! 😀 So glad I read this before making these burgers. Isn’t vital wheat gluten ALL gluten? So why would the substitute for something that is all gluten be “gluten-free flour?” Is this a mistake??? Would like to make these burgers but have no interest in buying vital wheat gluten. Can I substitute regular flour or whole wheat flour? Thanks. Love your site and my weekly email. The gluten-free substitute is for people who can’t have gluten. It won’t behave exactly as gluten does, but for people who can’t have gluten and want to make these burgers, its a necessary compromise. Of course, you can use wheat flour, but as with gluten-free flour, the results won’t be exactly the same. These look wonderful. Black beans and sweet potatoes are my favs. Should these be frozen raw or cooked? Also could I sub spelt flour for the vital wheat gluten and would I use 1/4 cup? Thank you so much for all your wonderful recipes. I will be ordering the stainless steel form – what a find! Joan, you can freeze them either cooked or uncooked, but I prefer to cook them first. That makes reheating quick and easy. As for the spelt flour, you will have to start with 1/4 cup and add more as needed to make a very thick, not wet dough. The amount can vary depending on type of flour and how moist your potatoes are. I want to make these. They look wonderful. I do know that the combination of black beans and sweet potatoes are absolutely wonderful. Thanks for your recipes and enjoy your weekend. These burgers were fantastic! They are going to be my new go-to burger. Thanks so much Susan! I’m so glad you liked them, Bridget! Just wanted you let you know how much i enjoyed this burger. made a half recipe as a test run . Mine turned out to have a crunchy component to the outside…. Will be making these again real soon.! I like them crunchy, too, Murfina. I’m so happy you liked them enough to make them again! Thank you so much for the recipe! My mom made them this evening – so delicious and creamy! We’re great fans of this blog. With love from Jamaica, Alisha. Thanks for commenting all the way from Jamaica! I’m so glad to hear you liked the burgers! Responding to Loubylou, I did not have vital wheat gluten when I made these burgers. I used buckwheat flour and they burgers came out great! These are so delicious! My fiancé and I have decided we like these better than any veggie burger on the market. I plan to have a batch in the fridge all the time! Hi Susan, About how much do the 3 cooked sweet potatoes yield? I was just wondering if I could use canned pureed sweet potatoes that I have on hand instead. Thanks! Hi Susan, how much do the 3 sweet potatoes yield? I’m just wondering if I can use a can of pureed sweet potatoes that I have on hand instead? Thanks! Nicole, I didn’t measure it, so I’m not exactly sure, but my guess is that it would probably take 1 1/2 cans if the cans are 16 ounces. These are great! I have made them a few times and everyone loves them. Really good flavor with the spices. They freeze well. Thanks for the recipe. These are delicious! I will be making them again and again and freezing them too. I am fairly new to plant based eating and your website is a solid support for me. Thanks. Can almond butter be substituted for the peanut butter? Yes, though it won’t have as much flavor. In fact, I would probably just leave it out. This looks like a great recipe! I have one question – do you just put the peppers & onions into the dough raw? Whenever I’ve made veggie burgers before I’ve had to cook them a little first. Yes, this time I put them in raw to save time and I liked how they came out, but you could always precook the veggies if you prefer. I stumbled upon this blog a few days ago and decided to try this recipe. I made them yesterday and they are absolutely amazing! So much better than store bought veggie burgers and best of all I know what was put into them. I will be making these again soon and plan to freeze them for easy lunches. I look forward to trying more recipes! Loved the recipe! I only made about 1/3 and totally regret it! Next time I’m definitely going to make them in bulk and freeze them. I used GF flour, simply because I couldn’t find the vital wheat gluten and it turned out wonderfully. I also mashed up some avocado with lemon juice, salt and pepper to make a spread for the burgers and it was delicious! I made these last night and we loved them!! Thank you for all the great recipes. I love how this one got crispy on the bottom and held together so well. You are the best!! These burgers are great! They are going into the “rotation”. What would be a good sauce to put on these? There were amazing! Than you so much for all the wonderful recipes! Is corn one of the ingredients or am I mixing it with the simple black bean burger? Hi Susan, I made these burgers tonight and I love the recipe. I only had dry black beans so I had to soak them, next time I might use a can just for convenience. The only thing was the amount of cayenne pepper I might reduce, I used 1/2 teaspoon and they are pretty hot! But with lots of greens and some condiments I think it will be okay. Love the flavors, I mixed up the spices ahead of time while i was waiting on the beans…omg the smell was amazing! Thanks for all you do, I love your recipes!